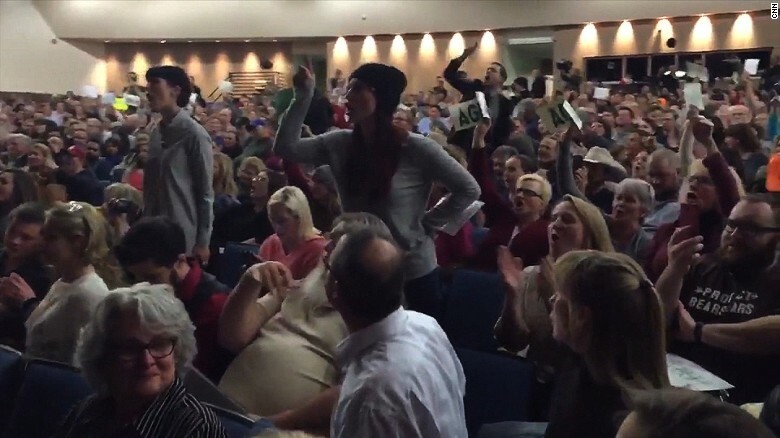 Republicans in deep-red congressional districts spent the week navigating massive crowds and hostile questions at their town hall meetings — an early indication of how progressive opposition movements are mobilizing against the agenda of the GOP and President Trump. One of the themes of new administration, as the NBC News Politics team recently noted, is how “Trump picks fights with, well, almost anyone.” Those stories help reinforce the perception of his toughness and outspokenness. The downside of these “sprays of attack,” as CNN’s Jake Tapper called them, are the “sprays of falsehoods coming from the White House” that accompany them. These controversies help further reinforce negative perceptions about Trump’s honesty forged during the campaign. Again, it is very early in the Trump presidency and the long term trends in his approval rating will be influenced by the direction of economy and by war, peace and scandal, or the lack thereof. However, if the initial flurry of executive action gives way to gridlock and legislative stagnation, perceptions of Trump’s ability to “get things done” may atrophy, and with it, his overall approval rating. We don’t know where Trump’s approval rating will be in 2018 and 2020. There are many factors beyond the actual actions of the president, and if the country is doing well despite Trump’s actions, the Republicans will benefit. However, the first three weeks of Trump’s presidency give Republicans a lot to worry about. Posted in Congress, Donald Trump, Health Care, Hillary Clinton, Politics, Polls. Tags: Donald Trump, Health Care Reform, Justin Amash, Politics, Polls, Republicans. RSS feed for comments on this post.. TrackBack URL. In 2014 you also predicted that Dems would take over the senate. What if the actions of the President results in the country doing well? A doomsday scenario for Dems in 2018. I discussed the possibilities in 2014. I don’t recall making any predictions as to the actual outcome. I don't expect "fallout" until 2020. Turnout is lower in midterms, first, and second, we all know the Senate seats for 2018 are very Dem-unfriendly. That said, I expect a recession in about 2 years. If its effects linger into 2020, then yes, then. The Senate will be more difficult because the Democrats do have to defend many seats they picked up in 2012, when they had Obama on the ballot. They could do better than expected if Trump's popularity is low enough, but this is why I concentrated on the House and state legislatures.